Striking the perfect balance between functional design and ultimate luxury, house plans 4500 to 5000 square feet provide homeowners with fantastic amenities and ample amounts of space perfect for a variety of uses. The additional square footage in these homes allows for multiple bedrooms and bathrooms, often spread out across a sprawling single floor or intelligently designed multiple-story home. A 4500 to 5000 square foot house is a great choice for homeowners with large families or who frequently entertain overnight guests, ensuring that there are always enough rooms in the home for everyone to sleep comfortably. Many of these homes offer 5 bedrooms or more. It is also common for these bedrooms to include high ceilings, which not only enhances the scope of the space but imparts a feeling of openness that isn’t found in other types of floor plans. These high ceilings often extend throughout the house, sometimes leading to grand foyers with impressive central staircases or living rooms that can span the full height of the building. Additionally, home plans ranging from 4500 to 5000 square feet also include bonus rooms in the floor plan for even more design and usage options, such as a private office for an at-home business or a dedicated game room that can accommodate a billiards table or large flat-screen television and multiple video-game consoles. The beauty of plans this size is that they provide the homeowner with the freedom to create the home of their dreams. Many of these miniature mansion home plans also feature gourmet kitchens with enough space to include luxury items such as a double oven or granite countertop island. 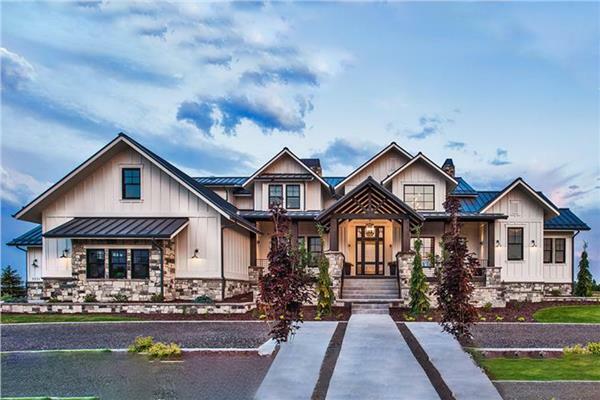 It’s also common to find a multiple-car garage or expansive patio in these home plans, as well as lush gardens and outdoor entertaining areas perfect for summer barbecues or enjoying a crisp autumn morning. We offer many plans in the 4500-5000 square foot range for you to look through here.